We urge all supporters of environmental justice to sign on to Stimulating Environmental Justice: How the States Can Use Federal Recovery Funds to Build a Just and Sustainable Economy. This short document includes a Vision statement and Talking Points, Recommendations, and a state advocacy-focused Stimulus Resource Guide. The entire document can be read and downloaded through this blog site. This statement is a potentially powerful way in which we can amplify and unify our voices across all our communities. We encourage you to incorporate and/or customize the Talking Points and Recommendations as they best fit your locality. To endorse this statement, please send an email to penn@ace-ej.org with your name, title, and affiliation and whether you are endorsing as an individual or organization. We also encourage you to send any comments or questions about the statement to the same address. A periodically updated list of endorsers will be posted on our WordPress blog site at https://ejstimulus.wordpress.com. This statement has been authored by a small working group of community-based environmental justice leaders. We intend for this document to be used by the environmental justice movement and our supporters to influence the disbursement of unprecedented federal recovery funds in our respective states. 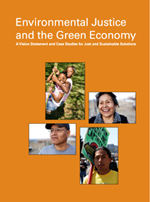 This working group will also release a more detailed report on environmental justice and the green economy in May 2009. Please direct any comments or questions to Penn Loh at penn@ace-ej.org. Download the full version of this statement from this site: EJ Stimulus Final 3.16.09.pdf. Since the 1980s, the environmental justice movement has been at the forefront of crafting sustainable solutions to local and global environmental and economic challenges. Although we were often perceived as an oppositional movement, community-based environmental justice groups have been pursuing a vision of community self-determination, green economic alternatives, sustainable use and replenishment of natural resources, and harmony with Mother Earth. We are now on the cusp of a great transition, as profound as that of the Industrial Revolution. Whether we emerge as a sustainable and healthy new world or fall into ecological collapse depends on the choices we make in this moment. President Obama has set a new tone for our democracy, based on making the right choices for our children and generations to come. • The unprecedented American Recovery and Reinvestment Act (“Stimulus” or ARRA) is a unique opportunity to promote change on a scale that has not been seen since the New Deal. How we spend $787 billion of our Federal funds may be the start of the greatest legacy our generation leaves to the future. • Stimulus spending decisions at the state and local level should be guided by and accountable to all communities, particularly those that historically have been most impacted by environmental degradation, and especially those that have been marginalized in policy discussions. • If we are to avert calamitous climate change, we know we cannot continue “business as usual.” We must end our addiction to nonrenewable fossil fuels and learn how to live in harmony with the natural systems that we depend on. This transformation will require deep restructuring, not just the adoption of green lifestyles by those who can afford it. It will require systems that do not depend on the exploitation of nature and people. It will require a shift from a throw-away consumer culture, in which certain peoples and lands are seen as expendable. It will require new ways of defining wealth and the American Dream that de-link our well-being from over-consumption of Earth’s resources. • Stimulus funds must represent long term investments in the flourishing of our communities, and in the productive future and life opportunities of many generations to come. Stimulus funds must incentivize the nation in minimizing consumption and reliance on fossil fuels, which are key sources of pollution and illness in communities of color and low income communities. • This great transition towards sustainability will be the ultimate test of our democracy. These decisions will affect us all profoundly and reshape our relationship to Mother Earth and to one another. It will require all of us to raise our voices and participate fully to decide how we will move together into a new era. • Sustainability is fundamentally a matter of justice. These decisions will determine who will have opportunities now and in future generations to access, share, and control new green wealth. Poor and marginalized communities need to benefit equally from Stimulus legislation. • As the “canaries in the coal mine” coming from “fence-line” communities, environmental justice communities have tremendous experience fighting unfair burdens and shaping sustainable and just alternatives. Our grassroots struggles have been blazing the way towards a more sustainable, democratic, and just society. We encourage our state and local governments to call on our expertise and use our local and regional work as valuable models on how to build a 21st century sustainable infrastructure and an economy that benefits us all. For the full version of this statement, which also includes Recommendations and Resources sections, download : EJ Stimulus Final 3.16.09.pdf.